Volume 4, Edition 7 Trouble loading? View this email online. 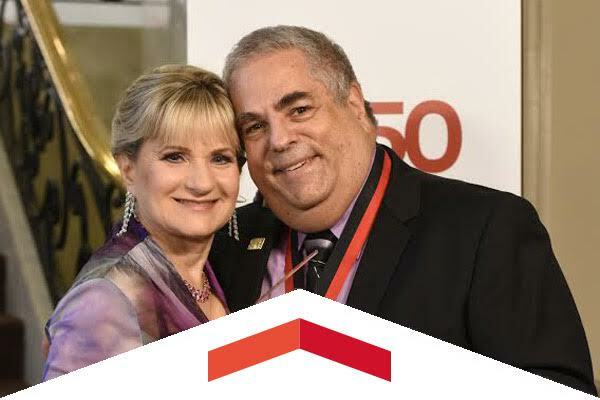 The big news revealed by CSUN President Dianne F. Harrison at the David Nazarian College of Business and Economics’ 50th Anniversary Gala was the $5 million donation by alumni Harvey and Harriet Bookstein. Upon CSU Board of Trustees approval, Juniper Hall will be renamed Bookstein Hall. The gift helped the college realize the $25 million campaign goal to change the face of business in Los Angeles and beyond. 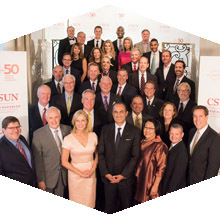 CSUN’s David Nazarian College of Business and Economics celebrated its 50th anniversary and honored its Fabulous 50 alumni on a night filled with great news for the college, hosted by alumnus and CNBC anchor Bill Griffeth. 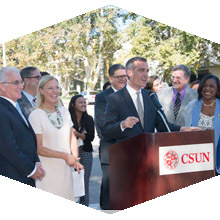 Los Angeles Mayor Eric Garcetti and State Sen. Bob Hertzberg visited CSUN to celebrate the success of the Metro U-Pass pilot program. Originally estimated to sell 500 passes for fall and spring semesters, the U-Pass has exceeded expectations with more than 1,500 sold in fall semester alone. Fri, Sept. 30, 7 p.m.
Get ready for an action-packed evening by attending the Spirit Night Fan Fair for free food, music and prizes in the F5 parking lot before the Matadors face off against Sacramento State in soccer and UC Davis in volleyball. Thu, Oct. 6, 6:30 p.m. This free outdoor performance is an ensemble that is comprised of four master drummers from India, thrilling audiences throughout the Indian continent. Bring your own blanket or chair. Food truck Bollywood Bites will arrive at 5 p.m.
Thu, Sept. 29, 7:30 p.m. The CSUN Symphony is regarded as one of the finest university orchestras in the Western United States. Under the direction of John Roscigno, the CSUN Symphony offers a full range of orchestral experiences, including choral, opera and musical theater performances. To help students who face food insecurity at CSUN, the Matador Involvement Center (MIC) and the Women’s Research and Resource Center (WRRC) have opened food pantries on campus. Faculty and staff are welcome to donate food items. The pantry at the WRRC is open from 8 a.m. to 5 p.m. Mondays–Thursdays and 9 a.m. to noon on Fridays. The MIC pantry will be open from 3 to 7 p.m. on Wednesdays and 11 a.m. to 3 p.m. on Thursdays, and is located behind the CSUN Campus Store Annex. The entrance to the pantry is on Lindley Avenue. The 2017 Faculty Retreat will be on Wednesday, Jan. 18, 2017. Proposals to give a presentation at the retreat are now being accepted. The proposal deadline is Monday, Oct. 17, 2016. For more information send an email to heidiw@csun.edu or visit the faculty retreat website. A chapter of ToastMasters International is forming for the CSUN campus. If you plan on joining or are interested in more information, please come to this meeting. Join the staff of Student Outreach and Recruitment for a discussion on the foundation departments should establish in order to provide stellar customer service, and the tools and resources that should be available to students and staff on the front line so as to avoid or de-escalate unfortunate interactions. Explore how going solar at home can save you money and represent your contribution to a greener environment. From 6 to 7 p.m. on Sept. 29 at the Colleague's Room on the 2nd Floor Sierra Center Learn, about terminology used in the industry and the most important factors homeowners should consider in choosing a solar system. Faculty who would like to be considered for election or appointment to positions in faculty governance, to standing or advisory committees of the Faculty Senate, or to various all-university committees and boards are invited to complete the university service form. To be considered for the spring faculty elections, please submit the form by January 23, 2017. For more information send an email to heidiw@csun.edu.